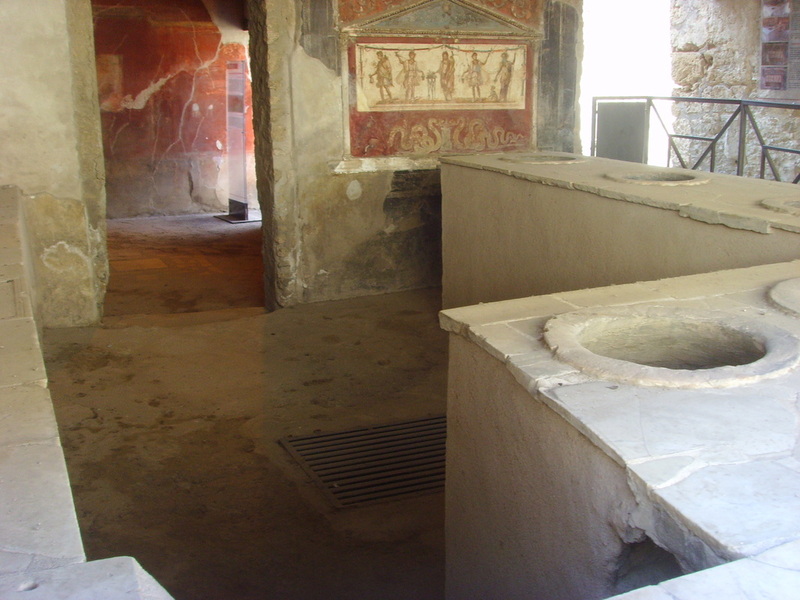 In addition, other styles of gaming are known to have been popular under the Roman Empire. The Emperor Augustus, for example, is reported to have enjoyed a very simple game of odds-or-evens, or ‘pair-impair’ involving the Emperor swapping stones between his hands behind his back, before presenting one hand forwards and asking whoever was around to gamble on there being on odd or even number of stones remaining in it.. Pigs’ knuckles were thrown into the air and caught on the reverse of the hand in a game of Astragals similar to modern jacks. 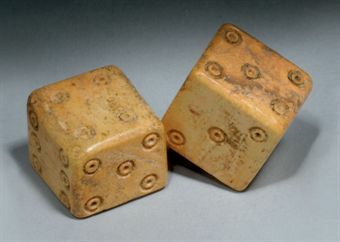 Gambling over dice was also common, a simple game being threes-and-sevens where, as the name suggests, players would repeatedly throw two die until someone accumulated a score of three or seven. Examples of loaded dice where a small amount of lead has been inserted into a drilled cavity to give weight have been found, giving rise to a most impressive innovation: the dice tower. 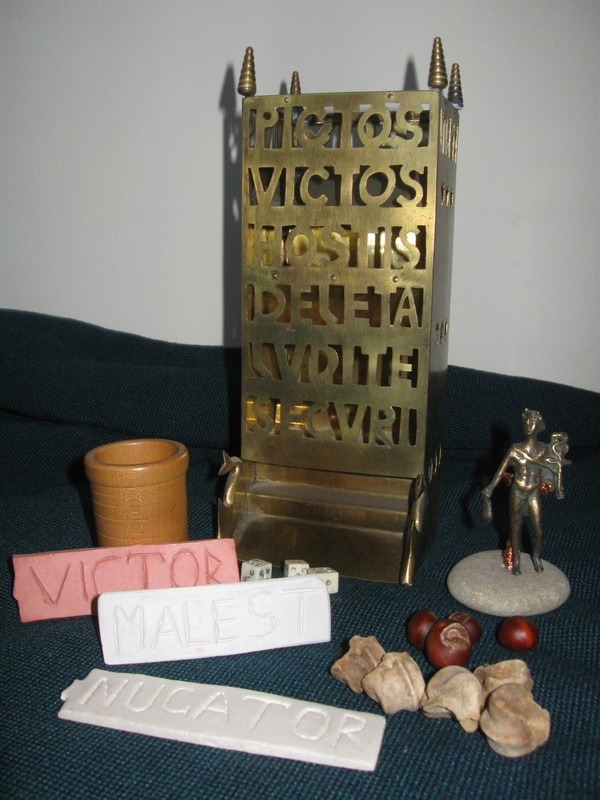 Our friend Steve Wagstaff made this beautiful copy of a dice tower found in Germania Inferior near the modern villages of Vettweis and Froitzheim, dating back to the fourth century, specifically around the time of Emperor Constantine (the original is shown to the right). As well as ornately carved pinnacles and dolphins, the tower contains text reading in translation: ‘Victory over the Picts, the enemies have been defeated, play in safety!’ (almost but not quite reminiscent of the modern small-print ‘use with caution, not suitable for small children’!). Along the back is the phrase ‘vtere felix vivas’ which can be translated as ‘use this and live with luck/happiness’ or more loosely ‘live happy and play well’. The tower is designed to eliminate the effects of loaded dice and prevent cheating in a gambling environment. You can almost imagine the situation: a bunch of wealthy and influential Romans lose a lot of money in a provincial gambling house and suspect the proprietors of cheating (after all, why would they be more honest than modern casino-owners?). Faced with a scandal, the gambling house decides to invest in a number of elaborate devices to secure their reputation by supposedly eliminating these foul practices. On the gambling house theme, at a number of sites believed to have been home to such establishments, clay chips have been found reading either Victor (winner), Malest (bad luck) or Nugator (fool), possibly these were used either as winner’s tokens to be exchanged with the banker in return for the jackpot, or in the latter two cases as a cruel joke – the wooden spoon prize! 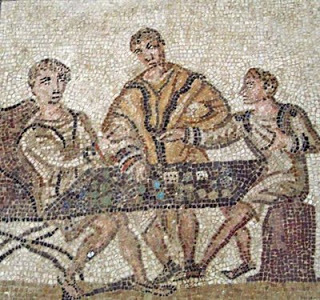 Gambling as a pastime was treated somewhat hypocritically by the Romans. On the one hand, it was recognised as a ruinous pastime and numerous efforts were made to eradicate it. Both the Republic and Augustus passed laws restricting gambling except during the Saturnalia, with a fine of quadruple the stakes should gamblers be caught – but this was rarely enforced to any great extent, and it was common knowledge that many of the emperors as well as notable aristocrats were addicted to gambling. Commodus even used the proceeds of such disreputable activity to try to stem the financial turmoil of his regime. After these feeble attempts at curtailment, the habit was tacitly tolerated until the Byzantine emperor Justinian decreed that all games of chance alone were outlawed – but not those of skill. Leather balls have also been found from Roman Britain. One game known to have been played is described in the Satyricon by Gaius Petronius, during the reign of Nero. This game, Trigon, involves three players throwing a single ball between them using only their left hands, perhaps to make it more difficult, the players could be forced not to throw-and-catch but to bat the ball between them like in volleyball. In the Satyricon, a number of servants are used to keep score and act as ball-boys. Seneca also described men playing Trigon for exercise and leisure whilst at the baths, linking to another game which I first came across at the reconstructed bathhouse at Segedunum fort, Wallsend. This is the Delta Game, whereby a triangle (the shape of the Greek letter delta, which has inspired design and innovation throughout the ages as anyone who remembers the Vulcan bomber will testify) is drawn and divided into sections. The players toss walnuts or pinecones from a distance: ordinary spherical stones roll in more predictable patterns, so it is far more fun to use something of an unusual shape. Scores are calculated according to where these nuts/cones land on the delta, if at all. In 1878, a life-size marble statue of a youth playing this game using nuts was discovered in San Lorenzo. To make a portable version, we have simply painted a board onto canvas. Apparently, this is still a popular game amongst Italian youngsters, now called campana. These are only a few of the games played by the Romans to socialise, gamble, exercise or simply just to wind down at the end of a hard day, but together they help to build up a picture of a vibrant community in which leisure time was valued and enjoyed. Games such as these were played by everyone from emperors to the masses, which is one part of what makes them just so appealing. Even in the modern days of digital technology, it is amazing just how absorbing people can find stopping by my gambling tent and playing a few Roman games (though sadly ethics continues to prevent me from actually playing for money or introducing loaded dice).